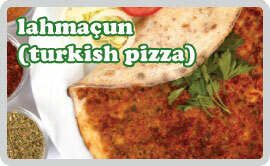 Turkey’s answer to pizza is something I hadn’t experienced before I visited the place. They were ridiculously cheap there and really tasty. However, one down point was that during one hungry evening in Istanbul we settled on a restaurant that was famous for its lahmacun. When it arrived, we were half way through only to discover that there was a baked cockroach included free of charge. This addition is purely optional and won’t affect the taste if you leave it out. 4 large shop bought turkish flatbreads or 8 medium pitta breads. You can make your own flatbread, but I have found this a good alternative. Put the lamb, onion, allspice, cumin and some salt & pepper into a medium pan and cover it with 150ml warm water. Bring to the boil pop a lid on and over a very low heat, simmer gently for about 1 – 1 1/4 hours. Take the lid off and let the sauce reduce till it’s thick. Turn off the heat stir in the parsley and set aside. While that’s cooking, heat the olive oil in a medium pan over a moderate temperature. Add the garlic and simmer for about 1 minute until lightly browned. Now add the tomatoes then the sugar and simmer gently for about 15 minutes. The tomatoes should have broken up a little but should still have a bit of texture. Remove from the heat and set aside. Place a flat bread on your work surface and spread 1/4 of the tomato sauce all over the bread. Make sure you reach the very edges. Now add some of the lamb mixture, again covering as much of the bread as possible. Place on a baking tray and cook in the oven for about 7-10 minutes. Repeat this process with the remaining ingredients.